Reductions in gross airplane weight to improve fuel efficiency will drive the aerospace floor panels market size from 2018 to 2024, with the market estimated to surpass US$230 million by 2024. Properties including high stiffness and strength-weight ratios meet the structural strength required for use in cabin interiors, and companies are developing chemical resistant and fire-retardant materials to ensure passenger safety in case of fire. Innovation regarding improving structural strength, rigidity and weight reduction to replace solid metals will boost the aerospace floor panel market growth. Continuous growth in air passenger traffic and flight iterations to accommodate passengers has swelled aircraft requirements. As per International Air Transport Association (IATA), annual air passengers in 2017 increased from 4.1 billion to 4.3 billion as compared to 2017. Aircraft manufacturers such as Airbus and Bombardier have enhanced their production capacity to overcome past backlog. In 2017, aircraft production grew by 4% to meet the rising consumer demand. These factors will positively influence the aerospace floor panels market share during the forecast period. The product is assembled during aircraft production and layered on the base structure, from cockpit to tail end. Flooring units are a major part of overall aircraft weight, and thus lightweight structures help in reducing overall weight. However, factors such as increasing component cost may hinder aerospace floor panels growth in this period. The commercial aircraft segment will contribute around 84% of overall revenue, with significant growth in overall aerospace industry until 2024. Rising annual spending and disposable income has amplified air traffic and increased international and domestic fleets. 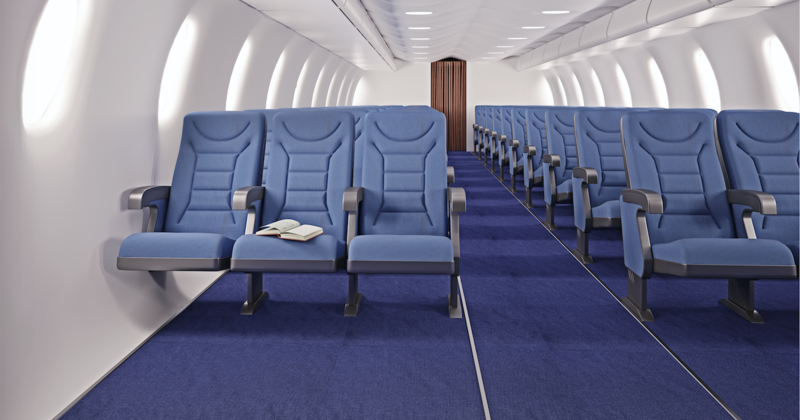 A surge in commercial aircraft production, particularly in developed regions including North America and Europe, will enhance aerospace floor panels’ market growth over the next seven years. The regional jet segment will register over 5.5% growth with an increase in regional jets to fulfill aircraft gap between turboprop and single-aisle long range airplanes, thereby accelerating product demand. Rising demand for business aircraft in Middle East and Africa owing to regional economic expansion and growing tourism industry will enhance aerospace floor panels market growth. Nomex honeycomb will witness 2.8% CAGR till 2024 owing to an increase in commercial aircraft demand. Properties including high fire resistance, stiffness, lightweight, thermal stability, excellent dielectric properties and superior strength will boost its utilization during the forecast period, as will availability in various cell sizes, strengths and thicknesses. Aluminum honeycomb will register robust growth due to its high strength-to-weight ratio. 90% recyclability of aluminum and non-absorbent properties reduce overall product cost and imparts high strength to structural parts, which enhances component longevity. Competitive product cost compared to other counterparts will boost aluminum honeycomb demand; the titanium honeycomb aerospace floor panel market segment is at nascent stage and will grow due to its corrosion resistance properties. OEMs will witness around 2% CAGR till 2024 owing to panel installation during cabin fabrication to reduce overall aircraft weight and ensure passenger safety. Industry players have entered strategic alliances with airplane manufacturers to ensure continuous product supply. 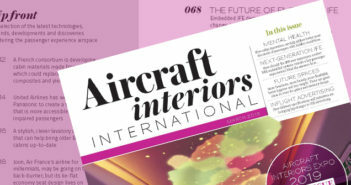 An increase in commercial and regional airliners will support aerospace floor panels market growth, and the aftermarket share will foresee robust growth with a rise in retrofit and refurbishment activities. 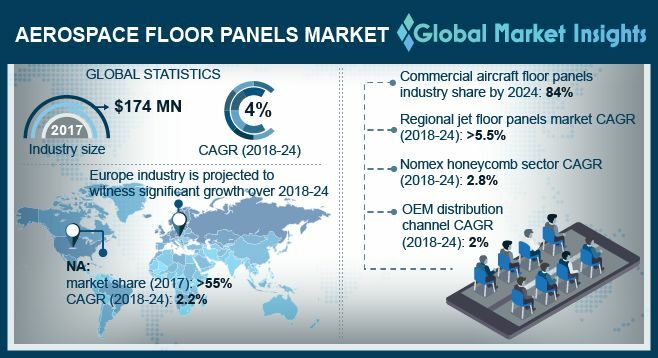 North America holds the major aerospace floor panels market share due to the presence of aircraft manufacturers such as Falcon, Lockheed Martin, Boeing, Bombardier and Airbus. Europe will register substantial growth with increasing air traffic. In 2018, Europe recorded around 5% passenger traffic increase in comparison with 2017, further supporting the product demand. The Middle East and Africa will witness growth owing to progress with the prevailing travel and tourism industry. 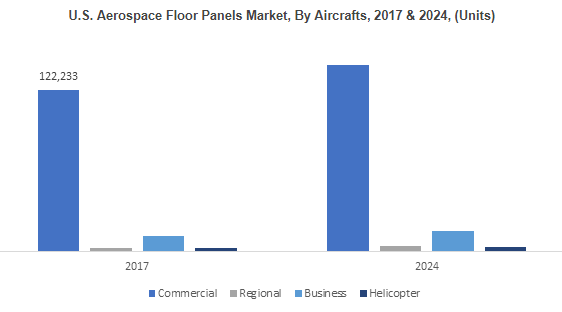 Major players of aerospace floor panels market include Advanced Custom Manufacturing, Euro Composites, Aim Altitude, EnCore Group, Nordam Group, The Gill Corporation, Zodiac Aerospace, Triumph Group, Avcorp Corporation, EFW, and Rockwell Collins. Industry players are undergoing strategic collaborations with airplane manufacturers to augment their market share. See HERE for more details of the report.